This famous Milanese Christmas cake is one of my favorite delicacies of the season! It is available at most Italian markets/delis (and World Market), and keeps remarkably well. 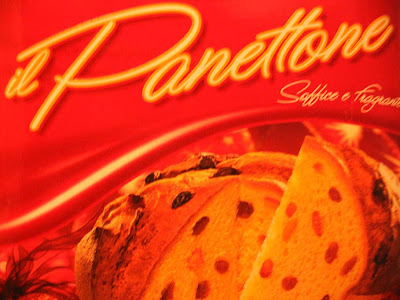 More of a sweet leavened bread studded with raisins and candied orange and lemon peel, Panettone is delicious alone, toasted with butter or lemon curd, ideal for french toast, or even used in turkey stuffing.. It is versatile and adds a festive punch to any recipe. This year, I think I would like to try making my own with this recipe from ItalianMade, served the traditional way with Crema Di Mascarpone. Yum! Keep an eye out for various Recettes Secrètes of mine throughout the season using Panettone!